The dreaded doorbell. It is a mom’s worst nightmare. 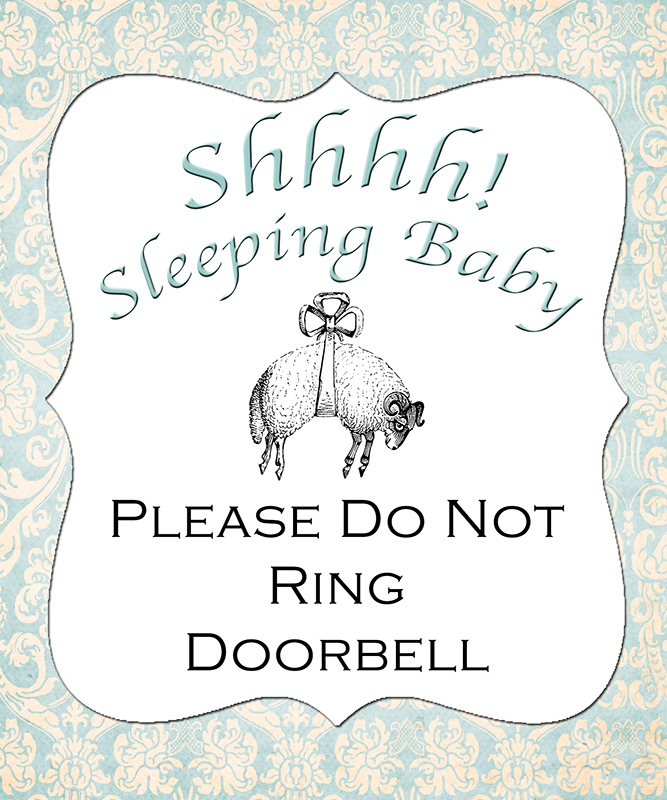 Have you experienced the horror of the doorbell during nap time yet? It’s not pretty. Let me tell you how it usually goes: Fussy baby needs a nap. Fussy baby won’t go down for a nap without a lot of nursing and a LOT of rocking, rocking, rocking. So tired mommy nurses and rocks (and rocks, and rocks) fussy baby until finally, FINALLY, fussy baby falls asleep. Tired mommy carefully lays fussy baby down in her crib, holding her breath so as not to breathe too loudly and wake fussy baby up. Very slowly, tired mommy tiptoes out of the nursery and closes the door. Relief surges through her. She breathes easier and is about to get started on some of the things she’s planned to hurriedly get done during nap time when, all of a sudden . . .
. . . followed by the cries of fussy baby and the curses of tired mommy. Never in my life have I wanted to murder the UPS guy as much as I did the day he woke my baby. 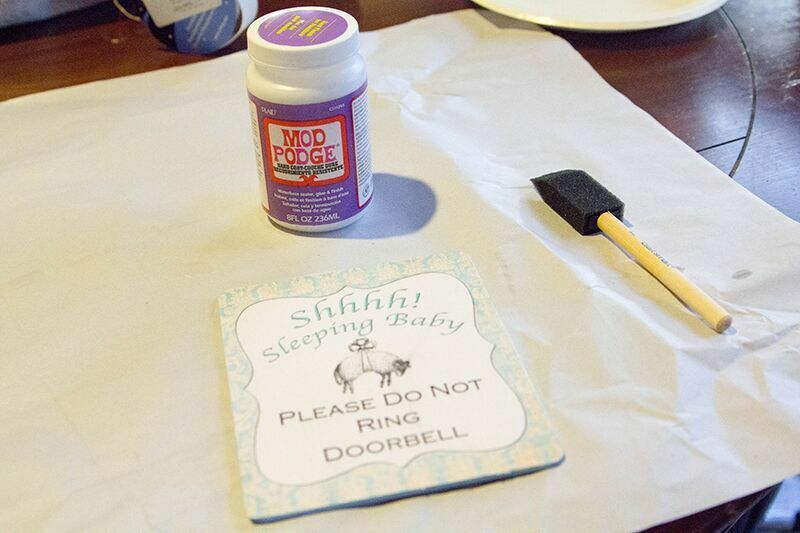 So I decided to make a “Sleeping Baby” hanging sign to dissuade would-be ringers from using the dreaded doorbell. 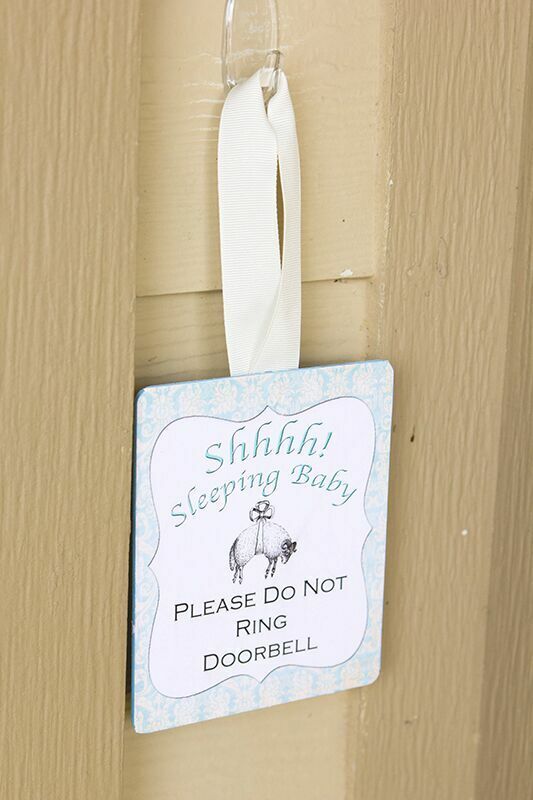 If you are a mama, I highly encourage you to make this sign or a version of it; it has been a lifesaver for me! First I painted one side of the wooden plaque and let it dry. 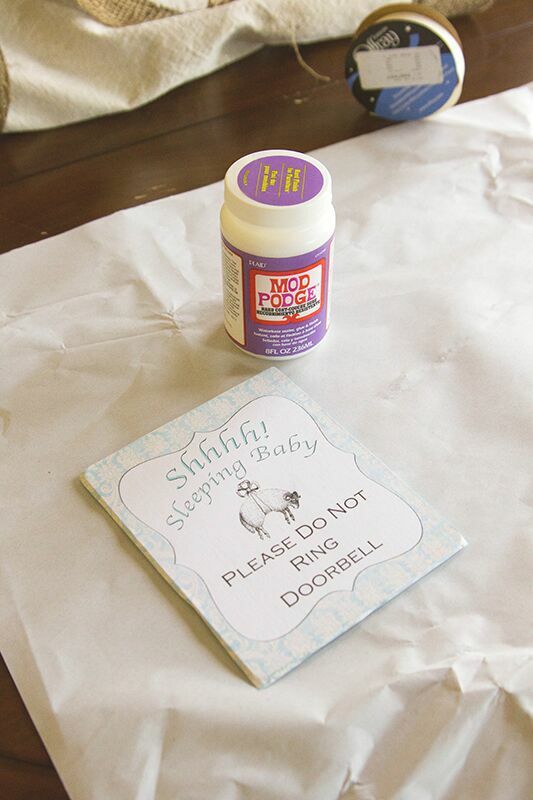 Next I cut out my image and, following the directions on the Mod Podge bottle, put some Mod Podge on the back of my image and placed it on the front of the plaque. I let it dry for a couple hours. 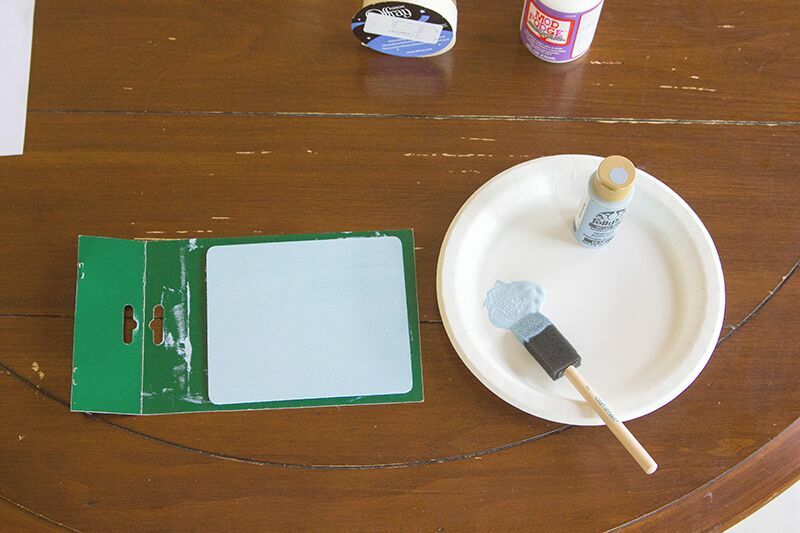 Still following the directions, I put two coats of Mod Podge over the front of the image, letting it dry for 20 minutes between coats. 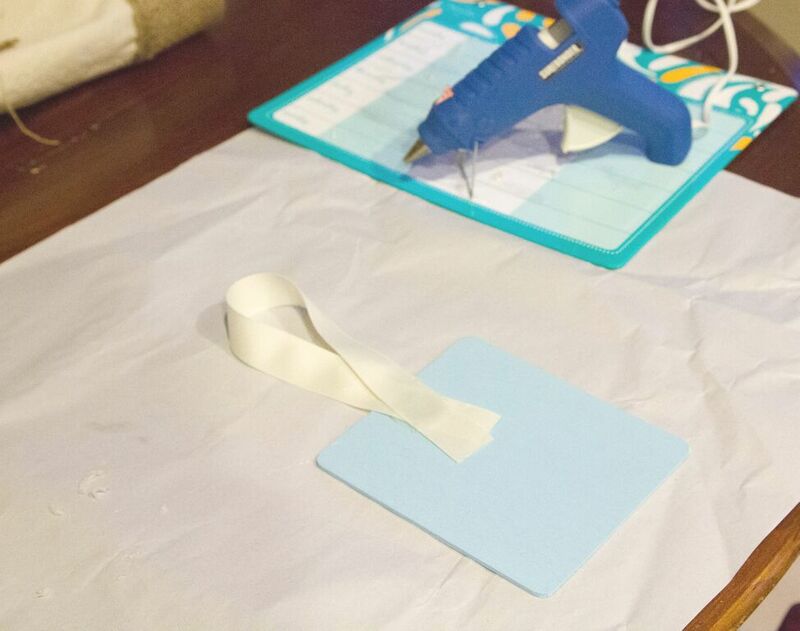 After the final coat dried, I cut a length of ribbon and hot glued it to the back of the plaque. 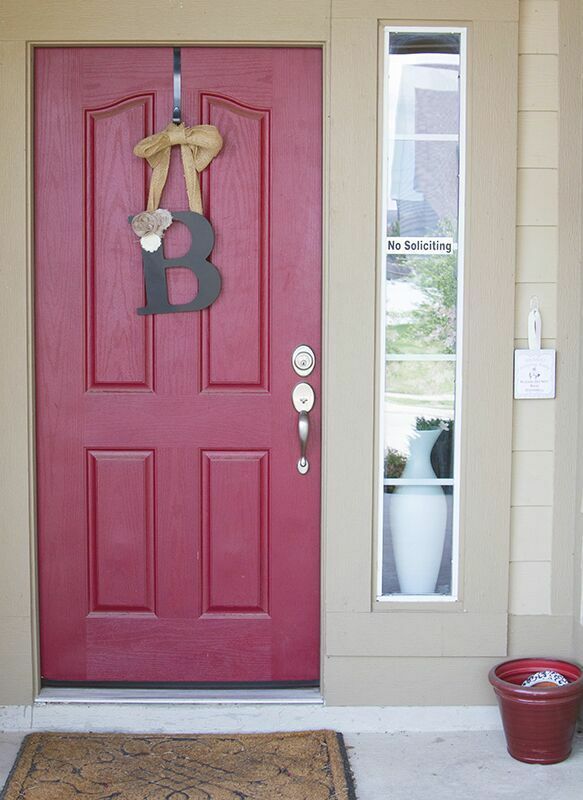 Finally, I grabbed a clear Command hook, hung it on the house right above the dreaded doorbell and hung my handy sign so that it hung over the doorbell. Voila! 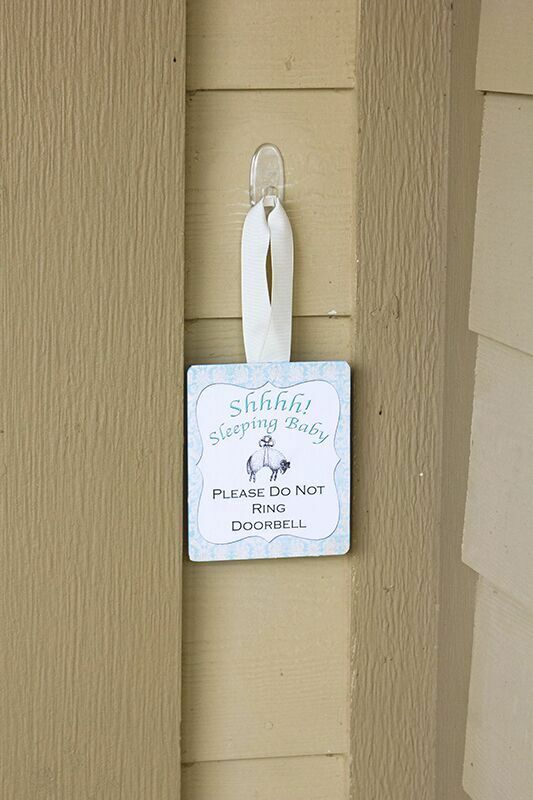 Seriously, this sign has been incredibly effective in deterring people from ringing the stupid bell. I’m going to go ahead and chalk this up to a major mom win. Success!